Stop Right Click Theft Protect Your Website. 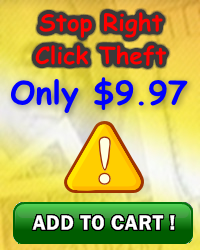 Stop Right Click Theft Protect Your Website software and tutorial. 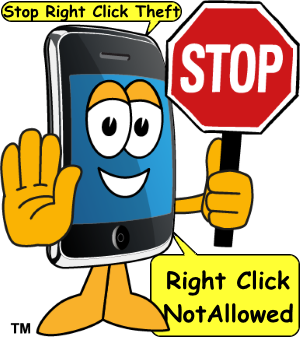 Stop right click theft and convert a would be thief into a paying customer with SRCT. Consider what could happen. You are surfing the web one day when you discover someone has stolen your content and using it on their own website. What do you do? Your valuable content has been ripped right off your website and is now on another. You disapprove but now what? Don't get mad, don't get even, get smart. It is a hassle tracking down thieves and demanding they remove your stolen content. You know you can prevent that from happening, right? With Stop Right Click Theft. Protect your content from those that would help themselves to your content. You know they just took it and didn't even leave a thank you note. Let alone ask for permission. "Grab this entire package with precoded and integrated "Stop Right Click Theft" script, embedded "Web 2.0 Reflection" script, that works great on header images or any other image you have on site - at a crazy low price!" Give those would be hackers what they deserve...your own custom sales pitch. Tell those thieves where to go...your special offer. 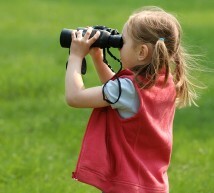 Turn those snipers into paying customers with 'Stop Right Click Theft' script. This easy to edit Full Mini-site Template with Private Label Rights. 5 Mini website templates - So you can create your unique version. Order button that matches this template design. "Right Click Income" - Script that is integrated with this template. You get 6 testimonial boxes like the one below. 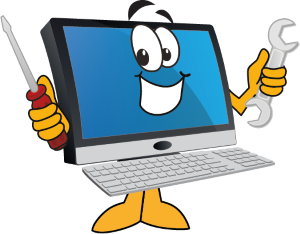 Simply copy and paste the code into your page and configure it for your website. Graphic boxes are already sliced and optimized for best performance. One Time Offer 6 different Testimonials boxes - easy to add to your website. My Boss Told Me to Sweeten The Deal! I'll Even Throw In This Cool Reflection Script - adds a mirror surface to your images, like they are sitting on a glass table. You control which images get reflected and how tall the reflections are. Yours free with 'Stop Right Click Theft' package deal. You can easily modify the height of reflection as well. The image on the left is set to 50% reflection while the image on the right is set to 80%. Normally this would cost over $97 or more...but since I am crazy, and I love what I'm doing and you are valued website Visitor. [NO] Cannot be packaged into an ebook or new product.